there I am with them." Hadra literally means 'presence' is the gathering of the Sufis to celebrate Divine Praise and to remember the Real Beloved in unison. It has been traditionally practiced by generations of Shadhili Sufis in North Africa under great Sheikhs as al-‘Arabi al-Darqawi, Muhammad al-Buzidi, and Ahmad al-‘Alawi. Even though such remembrance happen in gathering, to individuals Hadra often brings unparalleled spiritual ecstasy that is unattainable in private cell. The effect the heart experience in such gatherings, usually in the presence of the guide and the collective energy that rise from the zikr, the moan of spiritual ecstasy, the invocation, the tears that flow as one connects with one's innermost being - the cumulative effect is something totally out of this world when one experience it from the readiness of the inner heart. In modern world many Sufi groups preserve and practice Hadra and I was fortunate to attend Shadhili, Naqshbandi hadra as well as mixed hadra of Naqshbandi-Shadhili Sufis in America and the experience was simply superb. The experiences remain so vivid in my memory when I was listening to the sound of a hadra, I could identify and feel at one with the subtlest sound of the breathing inside it and the movement that goes along it. On the matters of tasting (dhawq), the less its said, the better. What follows is translation of an invocation in Shadhili hadra and the audio and video link is provided at the end. The message in the invocation of the harda speaks something that is related to solitude of the sufi that we shared in the last post. Poverty comes naturally to me. the totality of being comes from every particles of my being. My sweetest moments are when i am one with my essence. nothing is more beautiful than you. Set aside the otherness, understand the secrets. Enter the arena and you will see the past and the present. for existence, all of it, is your garden. If something is revealed to you, be happy. Appearances are a delusion. Rise to the fore. The signs are in you. To come near the King, diminish yourself. Apply your intellect to what is rational. The proof leads you to the proven. You will see, the bearer is what is borne. To say these (paradoxes) is a mistake, would be a mistake. Poetry and Music allows me to speak (the mysteries) to the people. Love the one you desire passionately and find enduring contentment. The journey is to yourself and you are the meaning of the felicity. There is nothing but you, O abode of essential poverty. > You may download the audio version from here. > Enjoy the hadra with video as shared generously by Hamza Halitovic @ Facebook. The word 'Poverty' (faqr) in this recitation is used to mean annihilation of the self, emptying the self from its pre-occupation anything other than the Divine. Thus Faqir is the one addressed here is someone who is at the station of faqr or holy poverty. In later part of the hadra man is address as 'O abode of essential poverty' which necessarily is addressed to the illuminated heart which is first, the abode of essential poverty so that it could become the abode of the Supreme King (Malik ul Mulk). For real Sufis, poverty is natural, in their disposition as well as their life-style. In the imitation of the model of Muhammad the Messenger, we find that he was the archetype of spiritual as well as in material sense a poor man. When as head of the state and head of his religious community, he was so generous that if he received something in the morning, he would be restless unless he could distribute that wealth or personal gift to the members of the community, specially one who was in greater need. He preferred poverty over kingship and known for his famous saying, "Poverty is my pride," Faqr Fakhri. This was also the essential quality of the earlier Messenger in the universal chain of brotherhood of Messengers: Jesus Christ who also embraced both outward and inward poverty. To Christ, as recorded in the Christian tradition, a piece of gold or a stone would make absolutely no difference. Jesus Christ being the seal of perfect sainthood and beloved of God, presents the station of holy poverty and thus all awliyas (beloved friends of God) also embodied the same station and remained as faqirs. The real seekers who has only the Real as the goal on the Path can not be pre-occupied in any materialistic things considering it any worthy in the dunya (ephemeral world) and hence renounced them according to their state of absorption. 'Intimacy' in the text refers to the intimacy of the individual soul with the Supreme Soul, God. 'Essence' refers to the Sirr (the Innermost Secret of the Soul). 'Amazing of creation' referes to mankind, whom God address in a sacred tradition, "Man is My Secret and I am Man's'. Also humanity as creation is termed as "ashraful makhluqat", the noblest of creation. Its said that God created everything in the creation for man, and He created Man for Himself (to recognize the Divine). After the beautiful dawn prayer with our master, we sit at the tranquil court yard surrounded by beautiful pomegranate trees, sipping tea and hearing the birds singing praise. At this time our master generally ask us if we had any interesting dreams last night that we wish to share. So when that moment came, Ishaq, a young man in our group spoke. "Master last night I saw in my dream that I was dancing in a gathering and there was a human figure in front of me, even though I couldn't see his face, but all I could feel is there was light radiating from him. His face seemed to have veil of light in front of it. And I was dancing in front of him with spiritual ecstasy as if I forgot everything else." I looked at our master's face and saw it lit up. 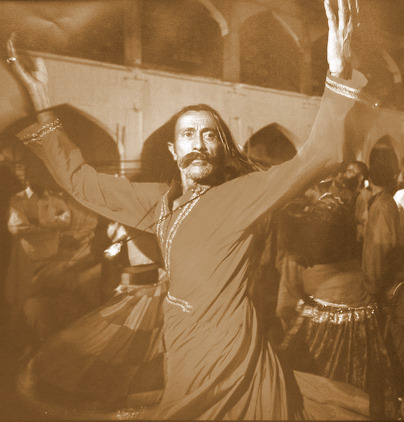 He asked Ishaq, 'were you dancing alone in front of this figure of light or there were other who danced as well?' Ishaq replied, O yes, I remember now, there were few other men with me. Not sure about the number, but we formed a circle in front of the light-radiating figure. And how the dream unfolded, it appears that you were made into one of the Ethiopians who danced in front of our beloved master. As the master finished, Ishaq and we all said, "Alhamdulillah! All praise is to Allah!" Indeed very rare souls are given the dream of the Rasul and we felt happy that our brother Ishaq is reaching that threshold. Then the master gave us a discourse on the history of Hadra, the gathering of the Sufis where they sing and move in unison with the rhythm of the zikr, enter into ecstasy and get charged spiritually. He also told us how this singing and praising in circle, holding hands like how Sufis preserved it, was one of the last acts of Christ, the Son of Mary, known as Spiral Dance and Hymn of Jesus. "A person coming to the Middle East to learn something about the tariqa is likely, at some point in his visit, to see the brethren in the hadra or “public dhikr” as it has been traditionally practiced by generations of Shadhilis in North Africa under such sheikhs as al-‘Arabi al-Darqawi, Muhammad al-Buzidi, and Ahmad al-‘Alawi before being brought to Damascus from Algeria by Muhammad ibn Yallis and Muhammad al-Hashimi at the beginning of this century. Seek the morsel that's beyond your grasp. Seek the saga that defies what's apparent. that even archangels cannot reach. Its transmitted in a sacred tradition of Islam that God promises that whomsoever sits at the gathering where God is remembered and anyone who sits there for the sake of remembering God alone is forgiven of all his or her past sins. God says, "I am as My servant thinks I am. I am with him when he makes mention of Me. If he makes mention of Me to himself, I make mention of him to Myself; and if he makes mention of Me in an assembly, I make mention of him in an assembly better than it. And if he draws near to Me a hand's span, I draw near to him an arm's length; and if he draws near to Me an arm's length, I draw near to him a fathom's length. And if he comes to Me walking, I go to him at speed." "Truly Allah leaves to stray whom He will, but He guides to Himself those who turn to Him in penitence - Those who believe, and whose hearts find satisfaction in the remembrance of Allah, for without doubt in the remembrance of Allah do hearts find true felicity."